Britain's Prime Minister David Cameron (R) talks with Russian President Vladimir Putin at a meeting at Charles De Gaulle Airport in Paris, France. Talks between President Vladimir Putin and British Prime Minister David Cameron in Normandy seemed to get off to a frosty start when the two leaders failed to give each other the traditional handshake, Russian media said, though the Kremlin later spoke of a thawing of relations between the two countries. The British message of what appeared to be a tense meeting between the two leaders on Thursday was that the situation in Ukraine was "not acceptable and it needs to change," Cameron said Thursday, BBC reported. "We need the Russians to properly recognize and work with [Ukrainian President Petro Poroshenko]. We need de-escalation, we need to stop arms and people crossing the border," Cameron was quoted as saying. 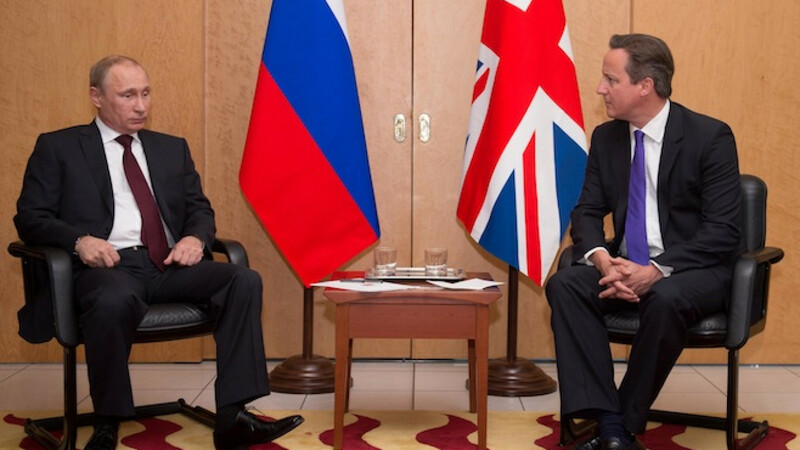 The Kremlin summed up the talks in a very brief statement, saying Cameron and Putin discussed reviving a "frozen" Russian-British dialogue, and that "much attention was devoted to seeking ways of resolving the situation in Ukraine." The statement provided no further details. All three of Russia's main news agencies — Interfax, Itar-Tass and RIA Novosti — reported that the meeting had begun without a traditional handshake. Kremlin spokesman Dmitry Peskov said Putin and Cameron shook hands at the end of the talks, though no cameras were present, Itar-Tass reported. The meeting between Putin and Hollande did begin with the traditional handshake, Russian media reported. The separate rounds of talks by Cameron and French President Francois Холланд with Putin marked the first face-to-face meetings between Western leaders and the Russian president after months of telephone calls about the Ukrainian crisis. Putin was also scheduled to meet with German Chancellor Angela Merkel on Friday. The talks came as Western leaders, including U.S. President Barack Obama, traveled to France ahead of celebrations marking the 70th anniversary of the D-Day Allied invasion of Normandy. Obama was not scheduled to hold talks with Putin in Paris, though the two leaders were expected to come face to face during Friday's events, The Washington Post reported.